The red and yellow Little Tikes Cozy Coupe is iconic in its presence in American childhood. I drove one as a child. So, there's no wonder why the company still makes them in several styles. I even read of a full scale, motorized coupe that could be driven on the road! 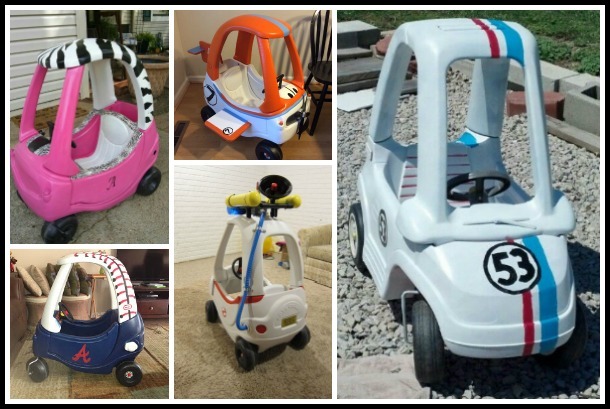 I love to see so many parents of my generation customizing a cozy coupe for their children. We just scored one for Sunny for $20 off of a local BST group on Facebook. I'd love to redo it, but there are so many ideas, I can't decide on one! Here is some of the inspiration I've found. Superhero themes for the win! 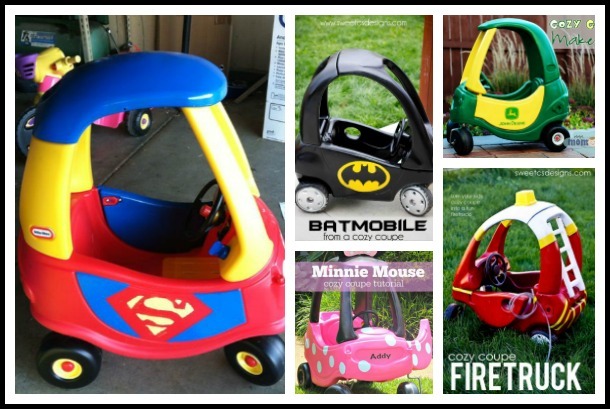 The Superman and Batmobile ones are cute and look like they have a minimal amount of detail work to be done. Perfect for not-so-crafty me! The ears on the Minnie Mouse cozy coupe are just darling! I could see my little pink-loving girl zooming around the driveway in this zebra print cozy coupe. Or we could do it up in our favorite team's colors... Go Hawkeyes! The Dusty from Planes cozy coupe is so neat! I wonder how they made those wings? Who you gonna call to help you recreate this Ghostbusters cozy coupe? All I can think of when I see this this Herbie cozy coupe is how cute my love bug would look in it. Even though Sunny prefers Cookie Monster, I bet she'd love an Elmo cozy coupe! The safari green military vehicle seems pretty straight forward and hard to mess up. I don't know why, but the purple leopard cozy coupe makes me think of Littlest Pet Shop... so cute! 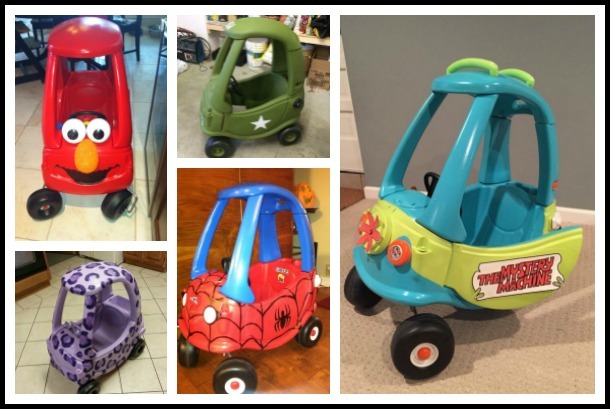 This Spiderman cozy coupe would have been perfect for my little superhero loving son. I'm flipping out over how perfect the details on this Mystery Machine cozy coupe are. I have to admit that the Doc McStuffins cozy coupe is my favorite. Am wondering how they did those cool stickers on there. My second choice is the Elsa cozy coupe. Sunny is just coming into all things Frozen, so this would be perfect! How cute is this cupcakemobile? The red ball on top for the cherry is brilliant. 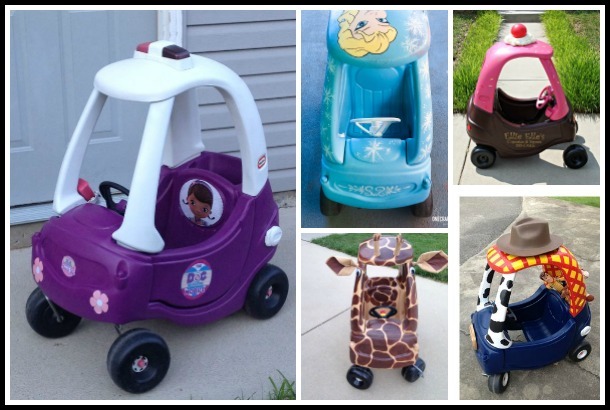 Or do we go with our favorite animal, the giraffe, for cozy coupe makeover inspiration? Lastly, there's this super fun Woody from Toy Story cozy coupe. This concept could be tweaked so it was done like the Jessie doll from the Toy Story movies, too. Well... stay tuned! 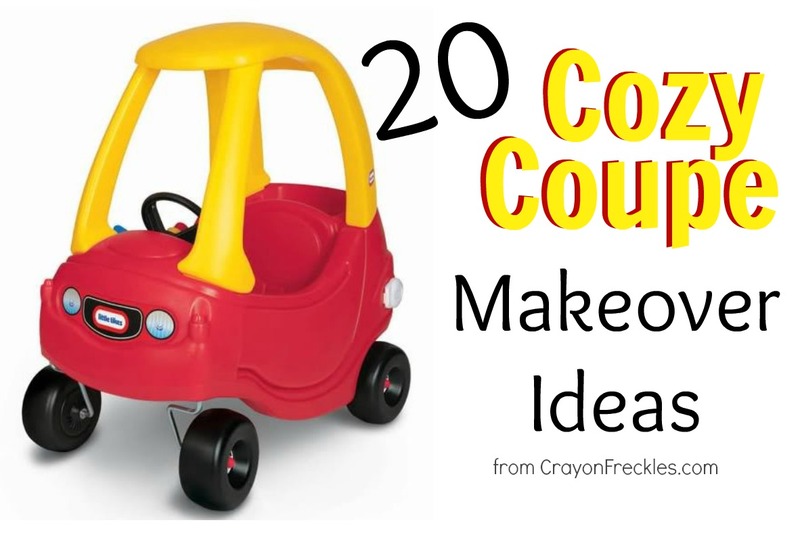 I'll let you know when I've figured out what theme we're going to go with on the cozy coupe makeover. Which one would you choose? Note: some of these links simply go to Pinterest pins. If the origins of them are you blog, please let me know so I can credit you!